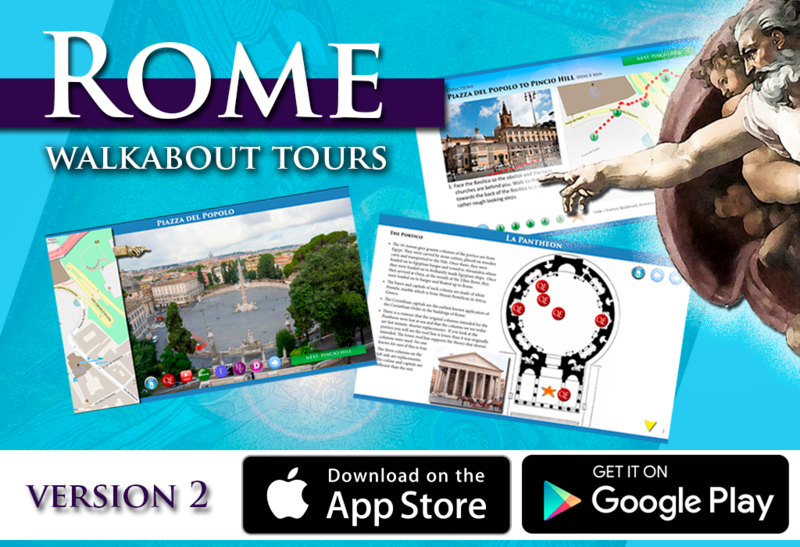 Rome at your fingertips in two apps! While you are relaxing at home or visiting onsite in the heat of ancient Rome, explore beautiful mosaics, the history of buildings, art techniques, materials used, and a bit about the people involved. View the ceiling decorated with Christopher Columbus's gold. Find out what it means to have a square halo. Look for the pope that was tied to an anchor and thrown overboard. Find the Phoenix. Stand inside the only chapel in Rome that is completely covered with mosaics; all while having your own, personal, art history guide in your hand. It is an amazing, fun and informative tour, which presents a rich and colourful early Rome. Mary Redekop, takes you on an enlightening art and architectural walking tour through Roman and Early Christian sites in the heart of Rome. This completely offline app is filled with audio, video and photographic content, as well as interactive step-by-step maps and directions to take you from one site to the next. No Internet or GPS connections are required to use the app once it is downloaded to your iPad. There are no advertisements and no In-app purchases. This isn’t your everyday, average tour of Rome… this is a great tour of Rome! An incredible one-day walking tour awaits you with a focus on Renaissance, Mannerist and Baroque art and architecture. But don’t let those words scare you because if you are walking through Rome you are already looking at these things you just might not know it! You may not have heard about some of these sites before, but you will never forget them after you experience this app! While relaxing at home or visiting onsite in picturesque Rome enjoy the best view of the city, see five unbelievable Caravaggio paintings, stand beneath a ceiling that is an optical illusion, and see the mouth that is really a door, or is it the other way around? The tour is designed to be walked in one day, but may take longer depending on the amount of time you spend at each location. The total walking distance is approximately 3.5 km, so wear comfortable shoes and carry a small set of binoculars so you can see fine details in the buildings and artwork. Mary is a well-known teacher and lecturer, who has been teaching art and art history in Canadian schools and universities since 1962. Her graduate and undergraduate studies were done at the University of Toronto. She has been guiding people through Italy, France, Russia, Uzbekistan and Turkey for over 35 years. She has developed and presented hundreds of lectures for the University of Toronto, Western University, Museum London, the McIntosh Art Gallery and Toronto Public Libraries. Her presentation style is delightful, informative, humorous and complete. The tour is also designed to be used in the comfort of your own home if you want to experience Rome without actually leaving your house! The audio was recorded during Mary’s Rome Walking Tour Lecture Series presented at Western University during the fall of 2014. Enter your name, email address and comment if you require more information.